This is the second in a series of posts that discusses everyday practical needs that almost no one ever talks about in providing care and making life easier for both us as caregivers and the loved ones with dementias and Alzheimer’s Disease that we care for. In the first post in this series, we looked at how to make things easier day-to-day for our loved ones in the areas of eating and incontinence. In this post, we’ll look at the areas of personal grooming and bathing in the journey through dementias and Alzheimer’s Disease with our loved ones. The progressive neurological damage of these diseases can affect our loved ones in several ways in the areas of bathing and personal grooming, which may necessitate accommodations for them in these areas. 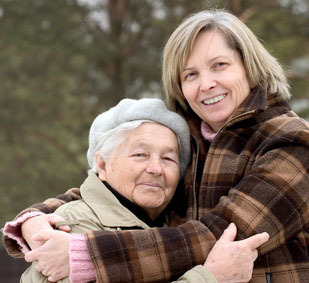 Before we discuss those in detail, it is imperative that we always respect the dignity of our loved ones with dementias and Alzheimer’s Disease, and that we give them as much autonomy and independence in all areas of their lives, including these, as is safe. Dignity is not negotiable. Our loved ones deserve that at all times and we owe them that at all times. Being more dependent and less able to take care of themselves is hard enough on our loved ones, but to not respect and maintain their dignity is humiliating and devastating. Our loved ones with dementias and Alzheimer’s Disease have been and are being robbed of their quality of life by an unseen or several unseen thieves in their brains. We should not be adding insult to injury by robbing them of their dignity. Independence is also critical to the well-being of our loved ones. Safety concerns will, at times, limit full independence. However, that should be the only reason we curtail independence in any way. Being a lot slower at doing things, being less than perfect at doing things, or forgetting how to do something but trying anyway should never be reasons why we take independence away from our loved ones. If we do, shame on us. The requirements of making bathing – including washing hair -easier for our loved ones with dementias and Alzheimer’s Disease will change as these neurological diseases progress. Showering or a full bath every day is hard on and can damage the fragile skin of our elderly loved ones. A good rule of thumb is alternating showering or full bathing every other day with the equivalent of a sponge bath. Harsh soaps and shampoos will also damage skin, including the scalp. Baby bath wash and baby shampoo is the gentlest option for bathing and shampooing hair. Skin also dries out as our loved ones age – diuretics will make skin dryness even worse – so we should make sure our loved ones are lotioned up well each day with a good hydrating lotion. Bathtubs for older folks are difficult to get in and out of and present a greater danger of falls. If you are reading this with younger loved ones you may be caring for in the future or even with yourself in mind, please make sure that a first-floor bathroom has a walk-in shower (ceramic or fiberglass frame – a metal frame can cut), which can be adapted for even greater safety using assistive devices. When staying in a hotel, be sure to request a handicapped room since these have walk-in showers (which are even wheelchair accessible, if needed). Make sure the bathing area is the warmest room in the house. As our loved ones get older and as dementias and Alzheimer’s Disease progress, sensitivity to cold is even more pronounced. If there is no additional heater built into the bathroom, use a space heater. About 15 minutes before bathing time, turn the heater on and close the door. This will ensure that the bathroom is at a comfortable temperature by bath time. Have everything you need for bathing, personal grooming, and dressing ready before starting the bathing process. This makes the process go more smoothly and efficiently and it ensures that we don’t have to leave our loved ones unattended – with the possibility of falls and/or injury – during the process. Water temperature is crucial and we must ensure that it’s not too hot or too cold. Run the shower (or sponge bath water) until it is on the warmer side of lukewarm as a general guideline. The sensation of water pouring down from a shower can sometimes be frightening for our loved ones with dementias and Alzheimer’s Disease as they approach the middle and late steps of these diseases. My personal theory is that it’s a combination of three things: a heightened sensitivity to change (resulting in confusion and anxiety), the suddenness of it, and the feeling of being wet. We will notice that some days showering is not an issue and other days it’s a huge issue. On the days that it’s a huge issue, it’s important that we don’t force our loved ones into a situation that is frightening for them, because this will increase fear, anxiety, confusion, and disruptive behavior. Instead, we should opt for a sponge bath or cleanup with adult washcloths and try again another day. As far as bathing and shampoo products go for shower days, I recommend Johnson’s Moisture Baby Wash and Johnson’s Baby Shampoo. While there are generic brands of baby body washes and baby shampoos, I found the quality inferior (i.e., they were more watered down) to Johnson’s baby products. Since these are designed for delicate skin, they meet the bathing and the shampooing needs of our older loved ones with dementias and Alzheimer’s Disease as well. Additionally, the shampoo won’t irritate the eyes if it drips into them. Since following directions – such as keeping eyes closed – is harder for our loved ones to do or sustain if they are able to do it, this ensures that no harsh chemicals get into their eyes while washing their hair. For non-shower days, I recommend using disposable adult washcloths. Adult washcloths are large and premoistened, usually with aloe added, and can be used very effectively to clean up. They are not flushable. 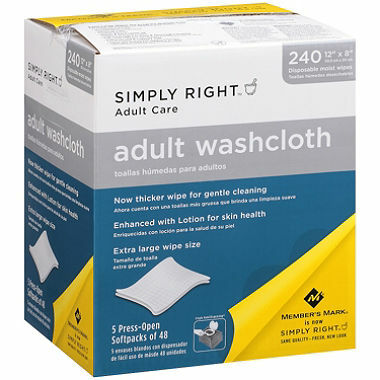 Adult washcloths can be bought inexpensively in bulk at warehouse clubs like Sam’s Club, Costco, and BJ’s (online or in-store). A product that many hospitals use for bathing that I do not recommend is no-rinse body wash/shampoo. One reason I don’t recommend no-rinse body wash/shampoo is that I don’t find that it does a good job of cleaning and it leaves a slight residue on skin and hair. The other reason I don’t recommend no-rinse body wash/shampoo is that it dries the skin and hair out, which makes the fragile skins of our elderly loved ones with dementias and Alzheimer’s Disease even more dry and fragile. There are several things that we’ll need to do to ensure the bathroom and shower is safe to prevent falls for our loved ones. Most modern bathroom floors are either ceramic tile or linoleum. Both of these surfaces are very slippery when they’re wet, so we want to ensure that the floor has an adequate amount of non-skid covering to ensure the safety of our loved ones when they are wet. Rugs and oversized bath mats are the easiest and least expensive way to cover the bathroom floor adequately. It’s also easy and inexpensive to ensure that they are non-skid by applying non-skid tape to the back of the rugs or bath mats. 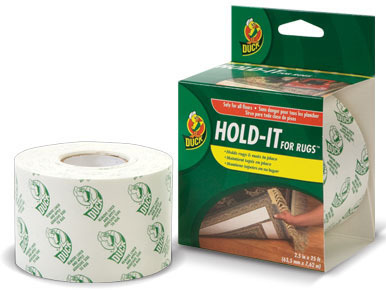 The best product I found for this is Duck® Brand Hold-It for Rugs™, which can be purchased through many venues online or at home supply stores. Non-slip tub/shower mats with suction cups are the usual recommendation to keep our loved ones with dementias and Alzheimer’s Disease from slipping and falling in the shower. However, my personal experience with these is that with most shower floors, the suction cups don’t adhere well and the mat moves around easily. So I don’t recommend these for the shower floor. Instead, I recommend non-skid strips or tape designed specifically for the shower. 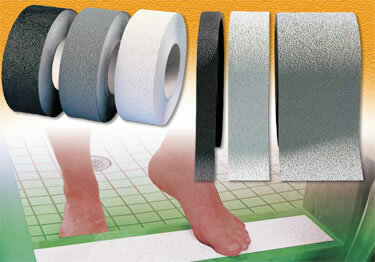 The entire floor of the shower does not need to be covered nor do the strips or pieces of tape have to be right up against each other (gaps between them are fine as long as they are not wide enough to cause a slip or fall) , but you do want the primary walking surface to have enough skid-resistant strips or tape in place to ensure safety. Like the non-skid tape for the rugs, this is very inexpensive and provides the maximum safety for our loved ones and can be purchased online at Koffler Sales Company. There is no quality difference between the 3M™ and KSC brands, but because 3M™ is a more-recognizable brand, the price for their products is higher. As far as the safety of our loved ones with dementias and Alzheimer’s Disease goes in the shower itself, there are two additions that I would highly recommend. One addition is a safety grab bar. There are two kinds of grab bars for showers on the market. One kind requires no hardware to install it because it uses a suction-cup locking system. The other kind requires hardware to install it (and, if you’re not handy, may require a professional to install it). Although the easy-to-install grab bar is less expensive overall, I don’t recommend it for our loved ones with dementias and Alzheimer’s Disease. Because it uses a suction cup to hold it to the shower wall, with enough weight or time, it could become detached and cause a fall. Therefore, I recommend the grab bar that uses hardware to attach it to the shower wall. Although this presents work and a possible upfront cost for installation, it gives our loved ones the extra measure of safety for fall prevention. The other addition that I recommend is a portable shower chair. Built-in shower seats are often small and in one corner of the shower, which doesn’t facilitate easy showering. However, the main concern with built-in shower seats for our loved ones is that they are slippery and the fall/injury potential is great. Shower chairs allow our loved ones with dementias and Alzheimer’s Disease to sit either during the shower or when they get tired during the shower. For the most comfort, I recommend a shower chair with a back and without arms. The shower chair should be placed in the shower near the grab bar. We should be on hand while our loved ones are sitting in the chair and we should always assist them – directing them to use the grab bar to help – getting up and down out of the chair. 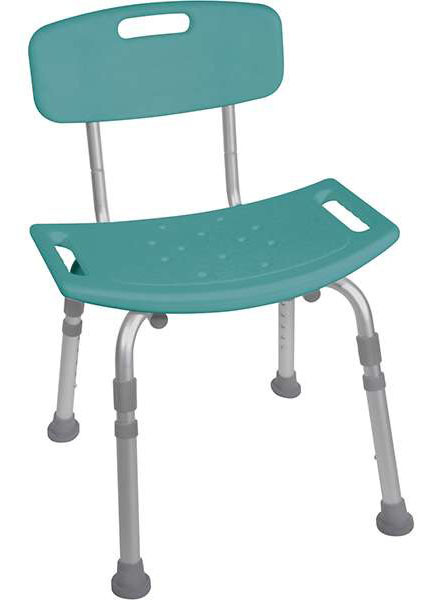 While the shower chair’s feet have rubber grips, the chair will move when our loved ones are standing up or sitting down. In the next post in this series, we will look at how to make life easier in the areas of mobility and functionality/accessibility for our loved ones with dementias and Alzheimer’s. ← Coping strategies with Alzheimer’s that invokes the feelings of guilt. Excellent advice. As a caregiver who works with adults in their homes, I especially appreciate your recommendations for non-skid strips for bathroom rugs (Duck® Brand Hold-It for Rugs™) and shower stalls (Koffler Sales Company). Thank you for your comment, Mary. I’m really trying to focus on some of these really important things that tend to get overlooked many times in providing quality elderly and dementias/Alzheimer’s Disease care.